It does not seem to be possible to remove immovables in the map editor. This is kind-of frustrating, if one has accidentally put something into a wrong place. Unless I have read the the editor tutorial poorly, the only solution is to restart from scratch, in which case this could be a documentation bug. I am not sure what you mean: I place immovables (e.g. trees) on the map. Then I can use shift+mouse to remove these objects (works with other types, too). You only have to make sure that you are "working" with the correct type: When you are placing animals, you cannot delete trees. This method should is mentioned in the editor tips (shown while loading): "Holding down SHIFT switches first alternative tool on. This tool is in most cases the complete opposite of the normal tool (for example deletion of an object instead of placing one)." Ok, my bad. Maybe https://wl.widelands.org/wiki/EditorTutorialPlaceResources/ could say what you just said. Load-screen is a bad only place for tips like that. Now, when animations are not reloaded all the time over and over again anymore, editor starts pretty fast. In my case, that happens well below one second. I do not digest tips that fast. A related question: If I would change terrain type ( say land to water or vice versa), then is there a way to remove the resource or, say, change fish on land to water, without first changing the terrain type back to water for removal of fish? Some time ago, loading (both a game and the editor) took much more time. Now it is a problem that new players cannot read the tips. See https://wl.widelands.org/forum/topic/1051/ which has mentioned the problem. Resources on the "wrong" terrain type (and their removing) has been discussed in bug 977980. I failed to follow the editor tutorial right -- even if the solution is obvious to anybody knowing the constraints, I would still forward this to sombody minding the tutorial as somebody else making his first map might wonder the same. If you feel that this is not worth it, let's close this ticket. My problem was gone after your first reply. I am glad I could help you with your problem. Regarding the tutorial: I do not know who made it, but everyone (who has an account) can change it, so feel free to improve this article. However, I do not know how many people look at that article (I found it out by myself). The keyboard shorcuts / functionality is also mentioned in the editor readme available from the main menu in the editor. Not sure what to do with this bug report. While it is documented already, it is a valid bug if people cannot find that information or if it isn't in an expected place. The problem of the bug is the visibility of information. This should be fixed when we have a proper help system - which is still a bit off I fear. For b18 the problem is even bigger, since we do not show the hints anymore - loading is too quick. I suggest setting this to invalid - the help bug is a kind of duplicate of this one. Should be done when the help system is finally in place. 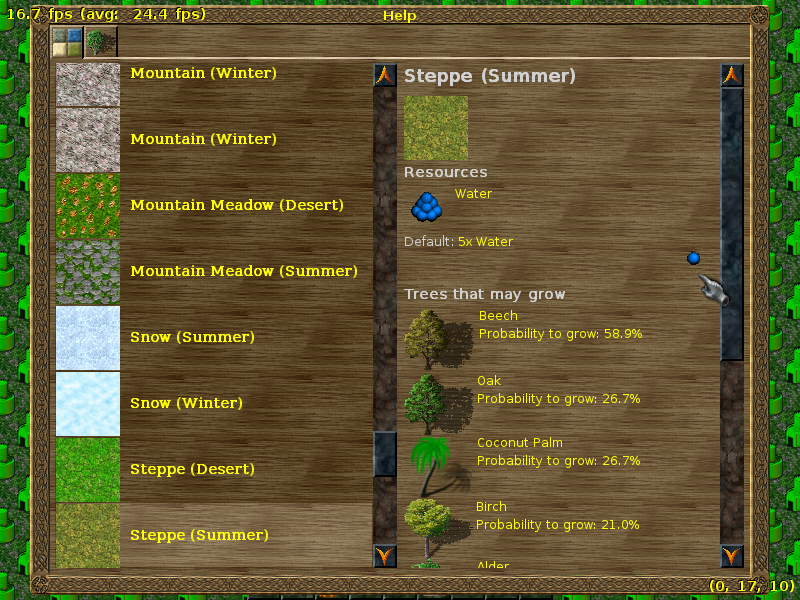 I implemented a help system - we could add a tab with general information to it. I like the design. I think this list will help map designers a lot (there have been some people wishing for this in the forum). 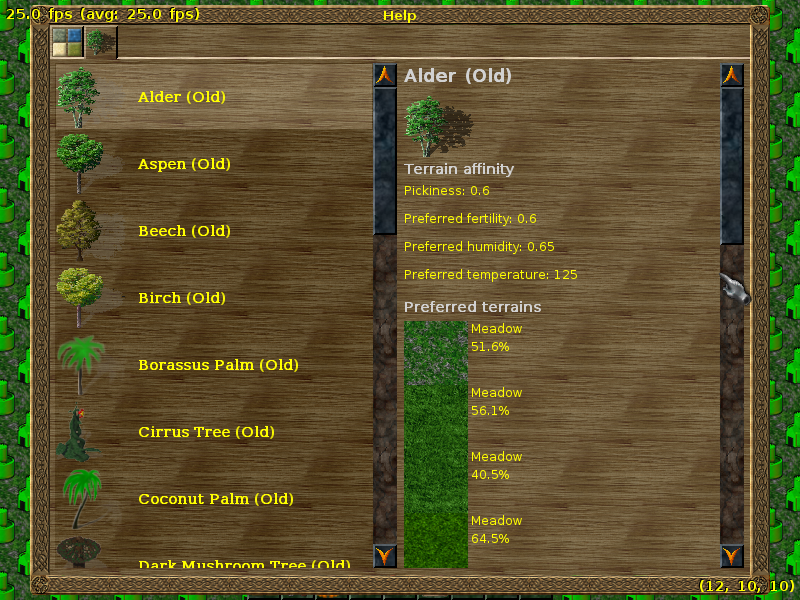 - Showing the terrain affinity only for the trees makes no sense. I would leave them out completely because the way to calculate the growth chance (or whatever is given) is too complicated (average of triangles, the the Gaussian shaped curve that somehow involves the pickiness) for a normal map maker. If people insist on keeping it, you should at least add the terrain parameters of each terrain. - What exactly does this percentage mean (or are they just placeholders at the moment)? - Can we get rid of the "(Old)" part? It should be clear that we only care for fellable trees. - I know we got rid of the numbers (Meadow 1 etc. ), but would it be possible to add the name of the biome for terrains that can come from different biomes (e.g. beach)? - Would it make sense to sort the lists by percentage? 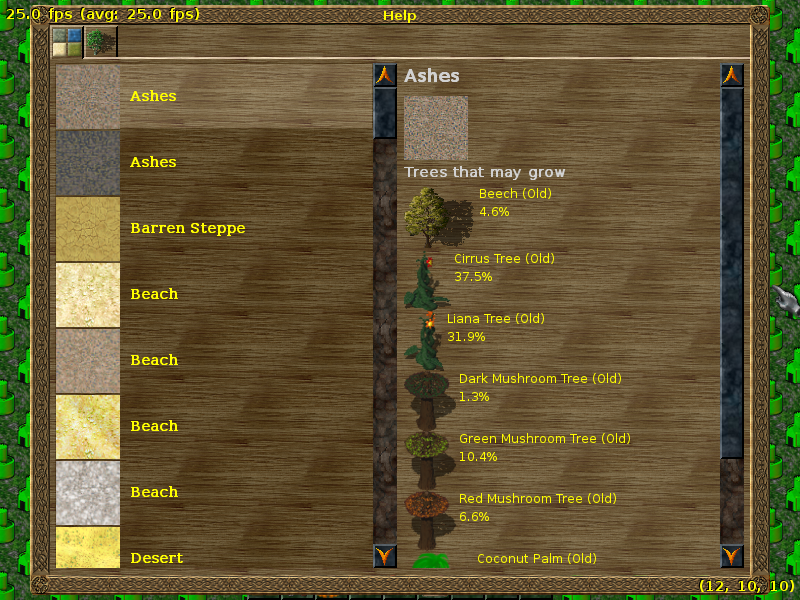 This would make it easier for find the best tree/terrain, but harder to find a specific tree/terrain. 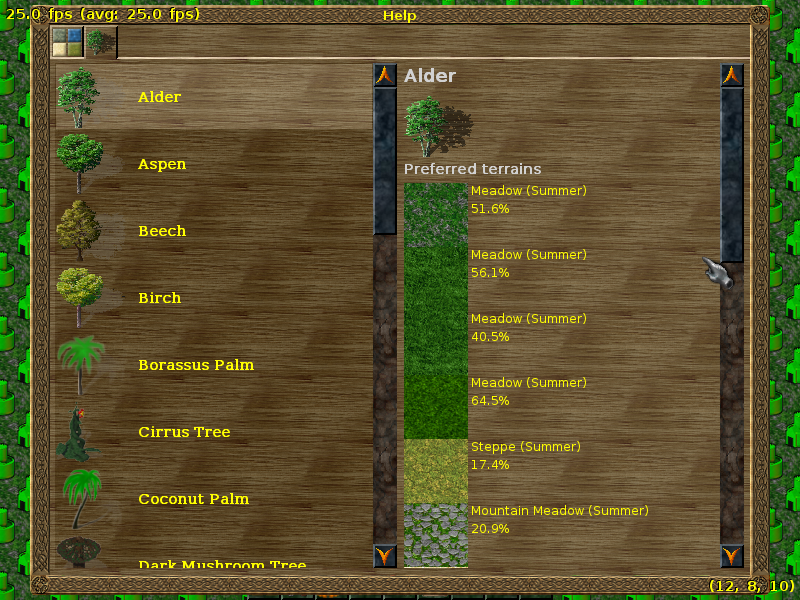 Also, how did you decide which trees/terrains to include in the list? I filtered for the fellable immovables. I agree that they need to be sorted. 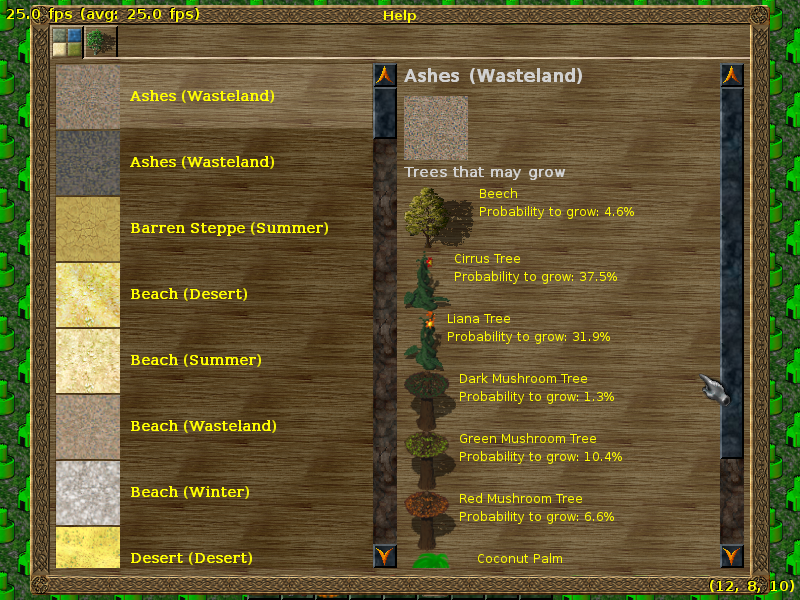 I have included everything that has more than a 0.01% chance for the tree to grow. 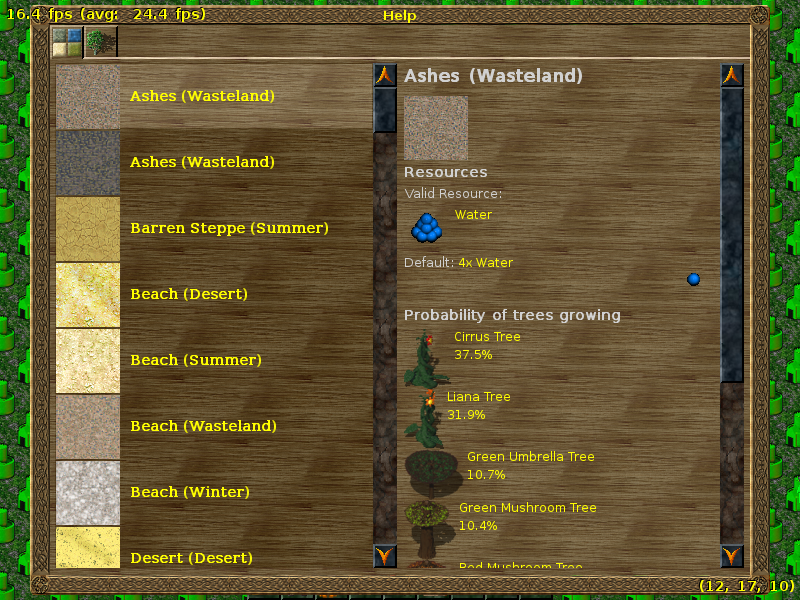 Added resource info to terrains. We now have an encyclopedia, but we still want something clickable from the fields. So, I'm leaving this bug open.